Women mindful of holistic health uniting in friendship across various communities to learn and pray for those in need. Each chapter meets every Rosh Chodesh. It's a spiritually uplifting and empowering evening and women receive a small gift connecting to the theme of that month. Join your local women’s circle to build healthy and supportive friendships with women like you! Click here to visit the Women's Circle Gallery for an inside look of previous events. 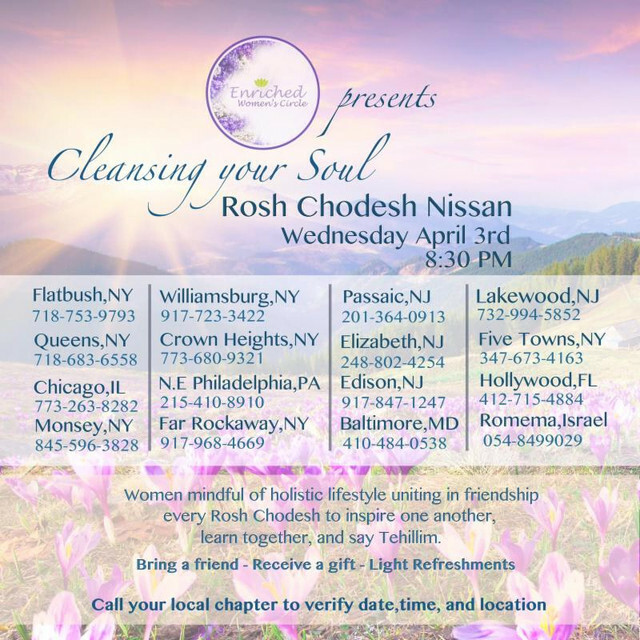 Click here to sponsor a monthly Enriched Women's Circle, Rosh Chodesh gathering and/or Tehillim in memory or honor of someone. All donation amounts are greatly appreciated and tax deductible! April 6th-Saturday (night) "Cleansing Your Soul"
May 6th-Monday "Bloom Where You Are Planted"
June 4th-Tuesday "Relax, Rejuvenate, and Refresh"
July 3rd-Wednesday "Have Emunah and Believe in Yourself"
August 1st-Thursday "Healing and Warmth"
November 7th-Wednesday "Enlighten Your Soul"
December 12th-Wednesday "Healing & Warmth"
January 7th-Monday "Fruitfulness & Growth"
February 6th-Wednesday "Discover Your True Self "
Looking to connect with other like minded women but no Chapter exists near you? Consider starting a chapter in your area to unite like minded women that are interested in holistic living. Contact info@enrichedparenting.org to inquire about the opportunity of becoming a chapter leader. You can also join our forum for more information!